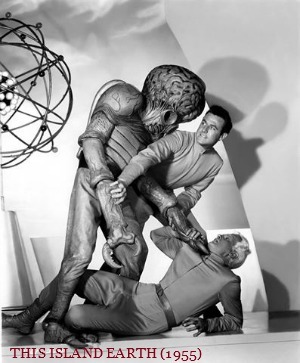 Retro Review: Stop the World, I Want To See THE DAY THE EARTH STOOD STILL Presented by Enjoy the Film and Cinevision! THE DAY THE EARTH STOOD STILL (1951); Dir. Robert Wise; Starring Michael Rennie, Patricia Neal and Hugh Marlowe; Thursday, Oct 23 @ 7:30 p.m.; Cinevision Screening Room (visit the event page for address and directions); All tickets $10 (Atlanta Film Festival members save 20%); Tickets here; Trailer here. 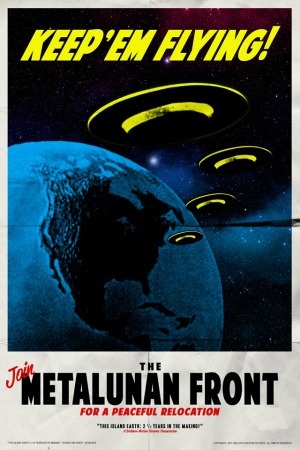 Let’s kick off the Halloween season in retro style, and take a trip to 1951 and THE DAY THE EARTH STOOD STILL. Ben Ruder’s Enjoy the Film has partnered with the Cinevision Screening Room for a series titled Monsters in Black and White, delivering three classic features screened in optimal presentations. Special guests introduce each picture, and the series promises to give an intimate “film club” type experience that is sure to make viewers wish that every film they see could be shown with as much care. In the years immediately following the media coverage of 1947’s mysterious crash in Roswell, New Mexico, the “flying saucer” became a symbol of mankind’s fears and hopes for the future. After seeing both the possibilities and dangers of science entering the atomic age at the close of World War II, and with nations looking toward the skies as they ushered in a new era in rocket technology, we gazed into the unknowable distances of space and wondered what an advanced technology might usher onto our tiny planet. Sure, there had long been stories of alien visitors landing on our world, ranging from H.G. Wells’ THE WAR OF THE WORLDS to Siegel and Shuster’s SUPERMAN comics. But the speculation around the events in Roswell brought the topic of extraterrestrial invaders directly into pop culture’s field of vision. And while so many of these tales dealt with hostile attacks from Little Green Men, one stands out as a plea for peace from the heavens: THE DAY THE EARTH STOOD STILL. 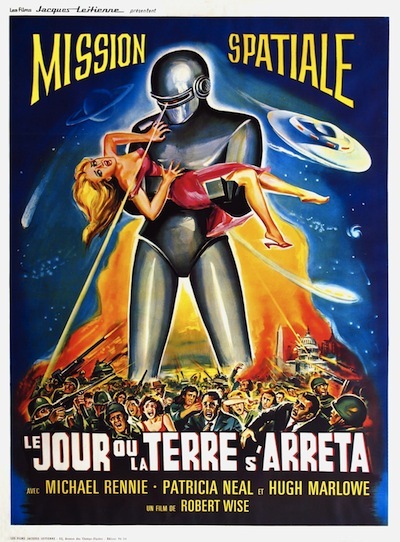 The film sees alien Klaatu (Michael Rennie) and his robot sentry Gort arrive on Earth to warn us against using our growing technological capabilities as a vehicle for greater violence, yet in a familiar turn, the benevolent visitor faces nothing but violence, resistance and persecution from the time of his arrival. The Klaatu-as-Christ metaphor (Klaatu—who also dies, is resurrected, and then ascends into heaven—even takes on the pseudonym of “Major Carpenter”) somehow escaped director Robert Wise’s view, but screenwriter Edmund North was clever enough to make the metaphor merely an emphasis of the movie’s universal themes. After all, the worries expressed in the movie knew no religious boundaries. We had just put the horrors of World War II to bed when the Cold War began, with tensions escalating between East and West. America had involved itself in the Korean War. Meanwhile, the US and USSR had started working seriously on competing space programs, and both sides had concerns that these programs would be of primary use as respective platforms of attack. All of these elements came together and formed the subtext of this film. And while the roots of the film’s themes are set deeply in the 1950s, the larger message of the movie—a call for understanding and cooperation between competing nations and ideologies—is something that never loses its poignancy. …All of which makes the film seem far preachier than it actually is, when you get down to it. The movie itself is more than simply its message; it is also a compelling drama with nuanced performances from Michael Rennie and Patricia Neal. 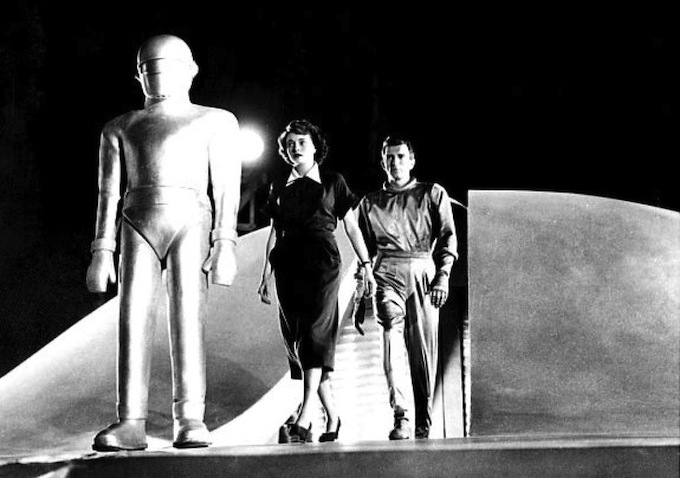 It is also thrilling, quickly paced, gorgeously photographed and full of groundbreaking special effects (few “flying saucers” of the era look as impressive as Klaatu’s, and Gort’s streamlined design is timeless in its elegance). Not to be overlooked is Bernard Herrmann’s classic score: a masterpiece of eclectic orchestration utilizing two theremins and a variety of electric instruments. It, along with the scores to 1950’s ROCKETSHIP X-M and ‘51’s THE THING FROM ANOTHER WORLD, would forever link the theremin with the eerie sounds of science fiction. A movie this impressive should be seen in the best conditions. And a well-preserved 35mm print with stunning sound, viewed with an eager audience, is the best way to experience THE DAY THE EARTH STOOD STILL. Lucky for you, then, that Ben Ruder, Enjoy the Film and Cinevision are giving you the chance to see it under precisely those conditions. Don’t miss out on catching this, one of the most impressive of all the classic 1950s sci-fi yarns in its natural habitat. Daniel Griffith, local award-winning filmmaker and founder of Ballyhoo Motion Pictures, will be joining a sinister line-up of horrorific guests at the inaugural Monsterama Convention, founded by our classic monster-lovin’ fiend, friend and ATLRetro contributing writer, AnthonyTaylor, which will be creeping into the Holiday Inn Perimeter in Dunwoody this weekend, August 1-3! So, prepare for a ghastly weekend of ghoulish proportions! Griffith will be joined by a guest list filled to the bloodcurdling brim with chillers like Victoria Price, daughter of Vincent; Hammer scream queen Veronica Carlson, director Jeff Burr, filmmaker Larry Blamire (LOST SKELETON OF CADAVRA), Bram Stoker Award-winning writer Brian Keene, ATLRetro’s very own “Chiller-ess in Charge”, Anya Martin, Kool Kat Shane Morton, a.k.a. Professor Morte [see ATLRetro’s Kool Kat feature on Shane here], Kool Kat Madeline Brumby [see ATLRetro’s Kool Kat feature on Madeline, here] and so many more! So, haunt on down to Monsterama this weekend and get your bones a’rattlin and your classic monster fix! Griffith, purveyor of all things cinematic and obscure, and no rookie to the B-movie and classic horror genre, has produced and directed over 45 documentaries, with his company, Ballyhoo Motion Pictures, spanning a wide-range of film history, genres and subjects. His documentary library is far too prolific to list them all, but in a nutshell he has directed and produced: THE BLOODIEST SHOW ON EARTH: MAKING VAMPIRE CIRCUS (2010), THIS ISLAND EARTH: 2 ½ YEARS IN THE MAKING (2013), [both will be screened at Monsterama this weekend], RETURN TO EDEN PRAIRIE: 25 YEARS OF MYSTERY SCIENCE THEATRE 3000 (2013) and THE FLESH AND THE FURY: X-POSING TWINS OF EVIL (2012). Griffith is currently in production on CELLULOID WIZARDS IN THE VIDEO WASTELAND: THE SAGA OF EMPIRE PICTURES, the official feature-length documentary delving into the rise and fall of Charles Band’s legendary Empire Pictures studio, known for cult films such as RE-ANIMATOR (1985), ZONE TROOPERS (1985) and GHOULIES (1985). His documentaries have gained him not only notoriety in the cult film arena, but also the 2012 Rondo Award for “Best DVD Bonus Feature” for his documentary biopic on Universal B-movie actor, RondoHatton, TRAIL OF THE CREEPER: MAKING THE BRUTE MAN (2011) and the 2013 Forrest J. Ackerman Lifetime Achievement Award. Griffith is also the official documentarian for the “Mystery Science Theater 3000” DVD releases. 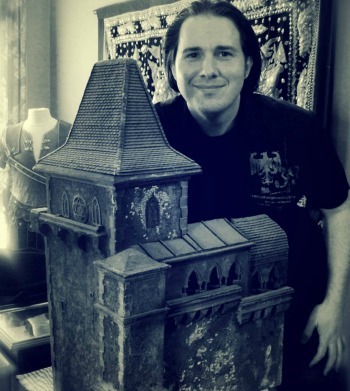 ATLRetro caught up with Daniel Griffith for a quick interview about his devotion to film history, from the greats to the barely-knowns, his desire to set a story to film and his trek into the deep dark cavernous minds of long ago filmmakers, plotting the map of film history. And while you’re takin’ a gander at our little Q&A with Griffith, take a sneak peek at an excerpt from his documentary, PSYCHO’S SISTER: MAKING THE NAME OF THE GAME IS KILL! (2013), delving into the history of the 1968 drive-in thriller! ATLRetro: As a documentary filmmaker, you are foremost a film historian and avid preservationist, which is clearly evidenced in the wide variety of documentaries you’ve produced with your company, Ballyhoo Motion Pictures. In the grand scheme of things, why do you feel it is important to not only preserve, but also to share these stories? Daniel Griffith: The media of the past serves as a type of looking glass or time capsule. It is the definitive visual representation of artistic achievement and human frailty. Therefore, it is important to have a documented record of how those works were created, if only to build awareness and preserve its shelf life. Selfishly, I became a documentary filmmaker to further understand the medium of cinema and television. To me, the film artisans of the past are the direct link to the motion pictures of the future. Studying and understanding their contributions was the BEST film school. But, as I moved from project to project, I began to recognize how many films and television series have drifted into obscurity. I guess I made it my responsibility to tell the story behind those works. You seem to give a lot of love and respect to the underdogs, to the films and projects of yesteryear that never quite reached the level of success in the industry that the majority set out to achieve. What is it about these films, these filmmakers that magnetize you? That compels you to tell their story? I never compartmentalize the films I document. To me, the least successful motion picture can have just as much value to an individual as the most revered or noteworthy. It is my duty as a film and television documentarian to change the way we look at the works of the past; to give each production an equal opportunity to share the spotlight. Who knows? A viewer may discover that the best stories of human triumph and creativity come in the cheapest, most misunderstood packages. 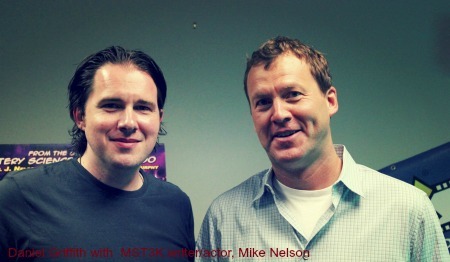 You’ve produced many bonus features and documentaries for Shout! Factory, Synapse Films and VCI Entertainment, etc. over the years, which has included a comprehensive peek into your fans’ favorite sci-fi, horror and ‘80s B-movies, westerns and a variety of retro filmmakers and film companies. Can you tell our readers how you became a documentary filmmaker? It began with a simple challenge; to singlehandedly create a narrative and follow through with its execution. About eight years ago, I was developing one motion picture script after another. Slowly, a case of cabin fever set in. I was restless. I wanted to get out into the field and visualize a story on film. While discouraged, I revisited a wacky holiday episode of MYSTERY SCIENCE THEATRE 3000, entitled “SANTA CLAUS.” During the opening credits, a title card reading “K. Gordon Murray Presents” appeared on the screen. I thought to myself, “Who is this K. Gordon Murray guy, and why did he choose to distribute this surreal, Mexican children’s film?” In that moment, a documentary concept was born, and simultaneously the seed that would eventually become Ballyhoo Motion Pictures. The name “Ballyhoo” draws to mind a long list of whimsical, colorful and raucous shenanigans of the circus variety. What’s the story behind the name? My company name and logo are comprised of several unique personal events. The logo itself dates back to my first exposure to the works of the cinematic showman, William Castle, and his film, HOUSE ON HAUNTEDHILL. The scream that accompanies the logo is the first scream you hear prior to the opening credits of that film. It was the scream that w oke me up as a child when the film played on television. Utilizing it in the context is my way of saying to the viewer, “WAKE UP! The show is about to begin and you don’t want to miss it!” And the name Ballyhoo represents two of my passions; the energy found on the midway of any traveling carnival and the promotional tactics used on the motion pictures of the past. As a guest on several panels at the first ever Monsterama Convention, including a Q&A session with Victoria Price, Vincent Price’s daughter, and a panel discussing documentary filmmaking, what do you hope to pass on to the eager ears of the convention-goers? Well, for one, this is a great opportunity to learn more about one of the greatest actors of our time. Vincent Price was not only a celebrated actor in film and television, but he was also an accomplished cook, author, painter and art critic. While he is remembered for his chilling performances in the DR. PHIBES films, as well as William Castle’s, THE TINGLER and HOUSE ON HAUNTED HILL, there was much more to him than the horror genre that sustained him. 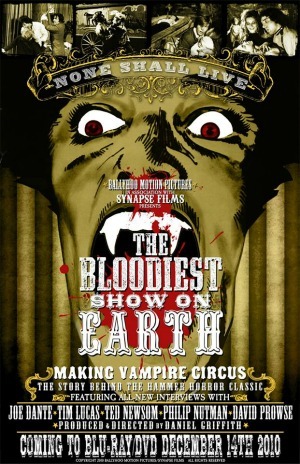 Additionally, two of your documentaries [“The Bloodiest Show on Earth: Making Vampire Circus” (2010) and “This Island Earth: 2-½ Years in the Making” (2013)] will be screened throughout the weekend; two very different documentaries, but both created with the same amount of respect and enthusiasm for the subject matter. Can you tell our readers what your favorite experience was while making each and what you would do different, if you could go back and change anything? Well, one of the greatest experiences I had working on all the Hammer documentaries, including VAMPIRE CIRCUS, was visiting the renowned Pinewood Studios in England. Filmmaker John Hough, who previously directed Hammer’s TWINS OF EVIL, gave me a private tour of the entire back-lot. This is the studio where most of the James Bond films where shot, the 1978 version of SUPERMAN, the first ALIEN film and Stanley Kubrick’s, FULL METAL JACKET, just to name a few. It was astonishing! As a filmmaker, you are getting the chance to live out your dream every time you create and release your work into the world, a dream you’ve had since your early childhood. Any advice for the next generation of Kool Kids who long to dive head first into the land of imagination and cinematic storytelling? Watch as many films as you can! Don’t be afraid to take chances on viewing films that are outside your comfort zone. Just because it’s black and white, or subtitled, doesn’t mean you will not enjoy it. Like an author with a library card, watching films is your first, best education. Who would you say are the filmmakers that inspired you most? In such a short amount of time, you’ve got 45-plus credits under your belt, releasing shorts to full-length documentaries, and have gained a following in the MST3K, B-horror and sci-fi circles, with a promise of more to come! Can you give our readers a hint of what’s next for Daniel Griffith and Ballyhoo Motion Pictures? In a perversion of Al Jolson’s famous line, I’ll have to say, “You ain’t seen nothin’ yet!” More Mystery Science Theater 3000 productions, for sure. I am currently in post-production on an epic documentary about the history of television’s most iconic series! However, unfortunately, I cannot divulge the title at this time. 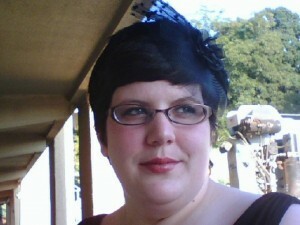 But, if you find me at Monsterama, I just may be persuaded to tell you. While attending the Monsterama Convention, you’ll have the opportunity to stop by the Ballyhoo Motion Pictures table to view original props from various B-movies of the past, as well as purchase EXCLUSIVE retro movie items! All photographs are courtesy of Daniel Griffith and used with permission. Dr. Watson and Sherlock Holmes. Painting by Mark Maddox and used with permission. This weekend (April 13-14) marks the inaugural edition of Atlanta’s own “all Sherlock Holmes” convention, 221B Con at the Holiday Inn Select Atlanta-Perimeter at 4386 Chamblee Dunwoody Road. The name is a reference to the famous detective’s address at 221 B Baker Street, London, which is a few blocks from one of H.G. Wells’ apartments as well. Making his debut in 1887’s A STUDY IN SCARLET, Holmes is one of the most well-known fictional characters in history. Sir Arthur Conan Doyle’s consulting detective appeared in four novels and 56 short stories written by Doyle, and countless dramatic and derivative works. Holmes fans are legion worldwide, with clubs and societies extant in just about every major city. 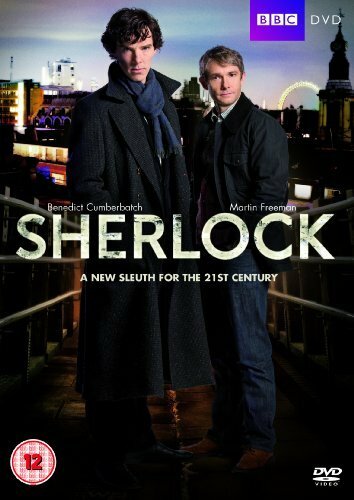 Currently there are two popular television series airing featuring Holmes and his sidekick Watson in modern settings; the BBC’s SHERLOCK, starring Benedict Cumberbatch as Holmes, and CBS’s ELEMENTARY starring Johnny Lee Miller. ATLRetro spoke with convention organizer Heather Holloway about the lasting impact of Doyle’s creation and to investigate what to expect this weekend. 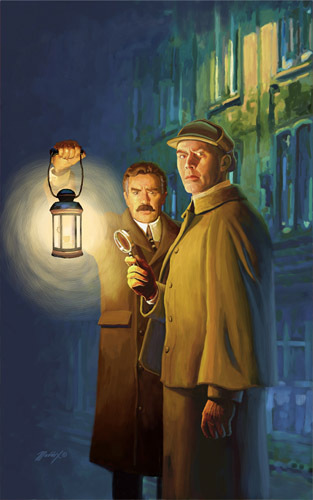 ATLRetro: Tell me about your personal relationship with Sherlock Holmes. How did you first meet him? What’s your favorite story? Favorite film/television adaptation? Heather Holloway: Sherlock Holmes and I met about three months into Mrs. Bright’s ninth grade English class. I was 14, and the assignment was to read “The Adventure of the Speckled Band.” Mrs. Bright told us how Sir Arthur Conan Doyle always knew the ending of the story before he wrote it so he could properly lay out the deductions and clues. That particular point struck me, as I had never given much thought to the plotting and structure of a story. Afterwards, I decided to read the Canon on my own and was pretty much hooked from there on out! It is so very difficult to pick a favorite story. I was recently rereading everything with two of the other directors of 221B Con, and it was pointed out that about two minutes into every discussion I would say ”This is one of my favorites!” I suppose if I’m made to pick I would go with “The Adventure of the Musgrave Ritual.” It’s so gothic and creepy, complete with a wronged woman and a man, possibly, buried alive. Heather Holloway. Photo courtesy of Heather Holloway. Every time someone asks who is my favorite Holmes, I always say “the one in my head.” It’s very difficult for me to completely get on board with a TV or film Holmes, because I was first introduced through the stories. I have a platonic Holmes and no one has ever completely lived up. I suppose that is why my favorite film versions are YOUNG SHERLOCK HOLMES (1985) and WITHOUT A CLUE (1988). They aren’t really supposed to be Holmes, so I have no cognitive dissonance. What about the Holmes stories appealed to you, and what about them has made a lasting impression ? I think the most important thing I have ever taken from the Holmes stories, and what sticks with me the most, is that prejudice is the death of mind. Holmes observes, he doesn’t prejudge or allow petty beliefs to interfere with his process. He takes what he sees at face value and interpolates from there. If you believe you know the answer before weighing the evidence, you have already lost. I think it’s a lesson many people today could stand to learn. It’s been said that Mickey Mouse, Superman and Sherlock Holmes are the most widely known fictional characters in history. More than 100 years later, what makes Holmes relevant to a modern audience? Why has he not only survived, but thrived? Sherlock Holmes is, to me, the great modern hero. There is nothing immortal or superhuman about his abilities. He has an approachable genius. He never claims others can’t mimic his abilities. While you might not see it at first, after a possibly condescending, explanation you realize that you could have seen it. Sherlock Holmes will be beloved so long as society admires effort and genius. Sherlock Holmes fans have been banding together for years. The only thing unique about 221B Con is the fact that it is a con. Most gatherings, while a ton of fun, are more academic in nature; big catered dinners and keynote addresses. The other convention directors and I wanted an event with a more relaxed atmosphere. We wanted regular fans to be able to speak, not just professors and biographers. Hopefully, we’ve hit a happy medium between fandom and academia. What will happen at 221B Con? Who are the guests and speakers? How can people get more information? We have over 40 hours of programming scheduled, including a live podcast by The Baker Street Babes, a performance by the Atlanta Radio Theatre Company and dozens of wonderful panels. We will be joined by several author guests including the Edgar Award-nominated author Lyndsay Faye. You can visit www.221bcon.com for more information, or follow us on Twitter, Tumblr and Facebook. 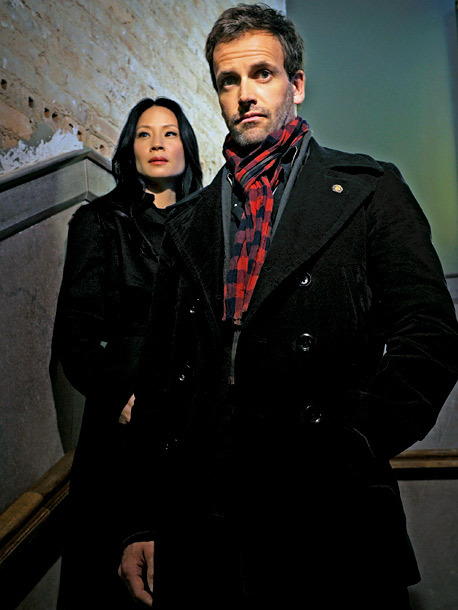 Lucy Liu as Watson and Jonny Lee Miller as Holmes in CBS's ELEMENTARY. Finally, it all comes down to this, doesn’t it – Benedict Cumberbatch or Johnny Lee Miller? 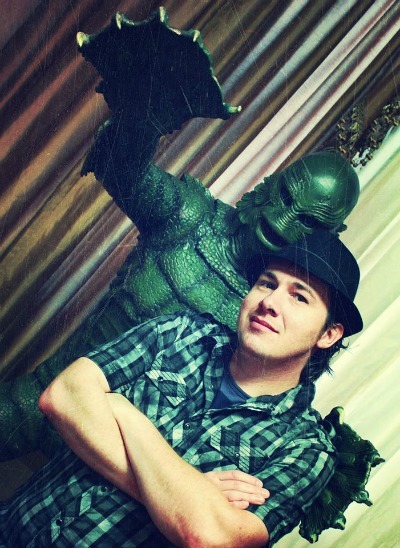 Anthony Taylor is a writer and an expert on retro-futurism, classic science fiction and horror films and television, and genre collectibles. He is the author of ARCTIC ADVENTURE!, an official Thunderbirds™ novel based on the iconic British television series by Gerry and Sylvia Anderson. His website is http://Taylorcosm.com.